Pennsylvania General Energy is committed to treating people fairly and honestly and forming partnerships based on trust and mutual success. Our commitment is reflected in our relationships with people and those who regulate our operations. Our staff works with landowners to help them understand each phase of the process. PGE bases drilling decisions solely on geological evaluation. When we pursue a lease, we expect that the property has the potential to produce marketable quantities of oil and natural gas. 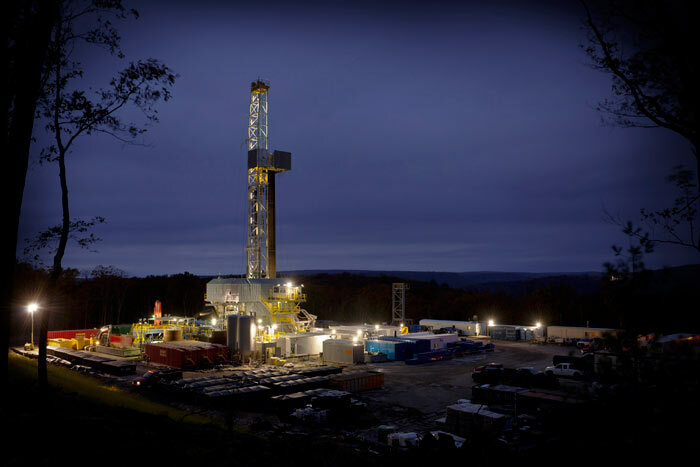 Once potential is identified, landowners/oil and gas owners are offered a lease (an agreement between a landowner and an exploration company giving the company the right to explore for oil and natural gas). They are first paid a bonus consideration for signing the lease then may receive annual rental payments during the term of the lease. If a well is put into production, royalty payments are made on oil and natural gas produced and sold. Royalty payments usually start about three months after the well is in production and are generally paid monthly thereafter. If you are interested in talking with PGE about leasing your property for oil and natural gas development, please contact our land department. How long will drilling take? The rig is usually on location for one to three weeks, depending on the depth of the well. We will operate the well as long as it produces in paying quantities. How will my property look after drilling? We will reclaim the area around the well to its original condition to the fullest extent practicable. What if the well is non-producing? PGE assumes all the financial risk of drilling a well. If the well is a “dry hole,” PGE will plug the well according to government regulatory standards and reclaim the property. State and Federal environmental agencies such as EPA, DEP, and Fish and Boat Commission regulate the oil and natural gas industry.